It's not even time for back-to-school shopping yet, and the fight for holiday shopping dollars is starting even earlier than usual this year. Toys R Us -- which has its own holiday coming when it goes public later this year -- is firing the first shot. The toy store chain launched a Christmas Savers Club to encourage customers to set aside money for holiday purchases starting in summer. Shoppers can start signing up now in stores or online. Customers who sign up before Oct. 16 get a 3% bonus added to the total amount they save by Oct. 31. The cards can be used for purchases starting Oct. 31 at both Toys R Us and Babies R Us stores or on their websites. "Through our Christmas Savers Club, parents and gift-givers can better plan their holiday spending well in advance of the season, while we provide them with a convenient, effortless way to budget," said Greg Ahearn, senior vice president for marketing and e-commerce of Toys R Us, in a statement. Indeed, since the start of the recession, shoppers have responded well to old-fashioned schemes such as layaway and Christmas Clubs as way to avoid credit cards and keep control of their shopping budgets. Starting with last year's back-to-school season, when layaway made a strong comeback, shoppers seemed to be going back to basics, even while opening their wallets. If comments on this site were any indication, when Sears Holdings (SHLD) brought back the Christmas Club last year at Sears and Kmart stores, shoppers hailed it as a brilliant idea for the cash-strapped times. And with retailers locked into an offensive play this year, getting reluctant shoppers to commit to purchases early will take on even more importance. 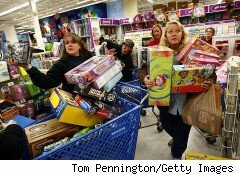 Late holiday shopping is now entrenched among consumers, who play chicken with discounters in search of markdowns. Retailers saw this last year both in the back-to-school season and over the year-end holidays, when shoppers raced to the finish line in a Christmas-week shopping blitz. After operating defensively last year by cutting costs and inventory, retailers are focused on stealing market share from each other this year, as many merchants noted during first-quarter reports. Consumers remain skittish about spending -- as reflected in the disappointing May sales figures -- and sales comparisons will get tougher as the year goes on, so stores are becoming more aggressive about sales growth by offering exclusives and special deals to lure customers away from rivals. Toys R Us in particular has a lot at stake in getting the holiday shopping season off to a strong start. The company recently filed papers to launch an initial public offering on the New York Stock Exchange this year. Showing some sales strength in advance of the IPO would be a good move for the company's stock price, considering it's up against discounters including Wal-Mart Stores (WMT) and Target (TGT), which last year tried to drive store traffic by offering $10 toys as loss leaders. Toys R Us was very aggressive last holiday season. Besides layaway and trade-ins, it expanded into mall retailing with temporary Toys R Us Holiday Express "pop-up" stores and added exclusive FAO Schwarz merchandise to counter the $10 toy offers elsewhere. With shopper spending still vulnerable to every kind of shock, from bad weather to a bad day in the stock market, getting a jump on the holiday competition could make Toys R Us look good for its own return to the stock market.